4) Handlebars—You would think that this is one place where both companies could come to an agreement in design. Yet when you mount each sled you clearly see a difference in design. The Ski-doo handlebars are clean. There seems to be more room for adjusting the throttle, brake and kill switch. The curved ends tend to feel more natural to the hand. Polaris bars tend to be crowded with the throttle, brake and kill switch (since the mountain bar takes up more space). The hooks on the end are basically at right angles and can crowd your little fingers. 5) Side Panel Latches—On each side panel there are two three latches on both the Polaris and the Ski-Doo. Two are the same, one is a little different. The Polaris latches are the easier ones to use. Although the two latches on Ski-Doo are quite easy to use, the third latch located down by your feet can be quite stubborn and is usually a pain to open. 6) Starting—On any given ride, you will start and stop your snowmobile dozens of times. And in the past, that meant pulling the rope multiple times a day. 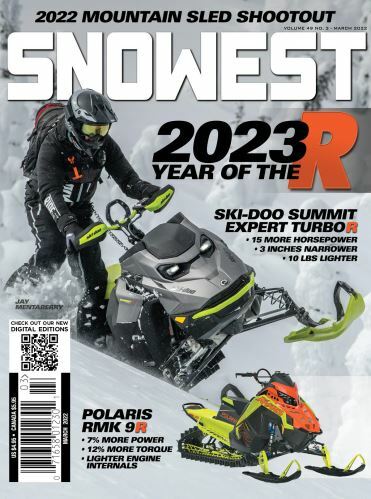 Ski-Doo has introduced SHOT, which allows you to start your sled at a push of a button … which really beats pulling a rope. If you want that ease with Polaris, you have to install electric start … which comes with some added weight and is not nearly as cool as SHOT. Ski-Doo has also doubled-up on the function of the SHOT button to multitask as the reverse button. Ski-Doo has also replaced the key system with a coded tether system. This is not only safer for the rider, but also much more secure as an anti-theft for the sled. 7) Gauges—If you like looks and function, you can’t beat the Polaris gauge. If you prefer simplicity, you’ll love the Ski-Doo gauge. For visibility and versatility, Polaris is far better. It’s easy to see, bright and colorful. And it several programmable screens so you can custom design what you see. Ski-Doo’s gauge is basically hidden from view so it’s a lot harder to see unless you’re standing up and leaning forward (in hillclimb fashion). Ski-Doo’s gauge features a fuel gauge. Polaris relies on the old-fashion fuel cap to measure how much fuel’s left in the tank (still one of the best indicators of fuel level). Rob Kincaid and Dave McClure's mod sleds.